How has the Dialogue Between Counsel and The Court Changed? Have the Qualities of Good Appellate Advocacy Changed? Does Advocacy Matter in the Final Court? Scots Appeals and London: A Fraught Relationship? Who Really Draws the Line? Where Should the Lines be Drawn? “Unless you're a Supreme Court Justice or a retired Law Lord, this book offers you the best available insight into how our highest court operates. In fact, even if you are on the Supreme Court, you're likely to learn something from Final Judgment. 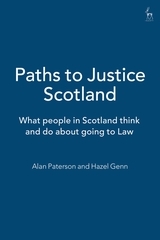 ...there is a huge amount of interest in this book for anyone interested in the judicial process. 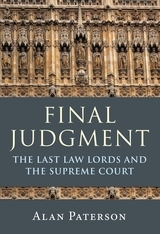 It is far from reverential, and the reader will come away with a much better idea of how judges at the top of the tree really make their decisions. 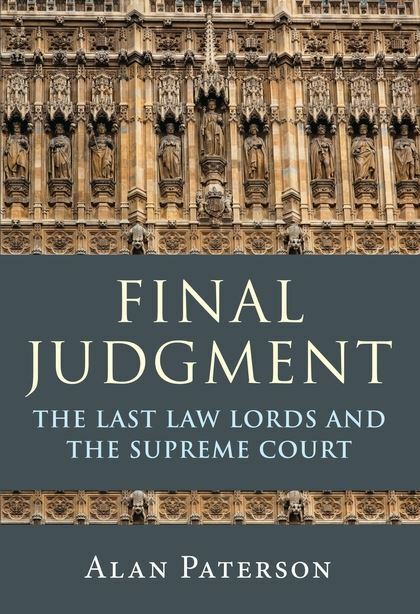 “It is both a fascinating survey and real life 'behind the scenes' review of the work of the Law Lords ... and their role in the highest court in the land. The work is unique in providing intimate portraits revealing the character and idiosyncrasies of the individuals who determine and apply the law at the ultimate level, because Paterson understands something that the Victorians also knew: that to comprehend the reasons why judgments are reached, one has to look beyond the mere 'letter of the law'. There is so much in this book that a review like this can only highlight some of the immediate and obvious points of interest, likewise it is difficult to offer any critical comment. There is a wealth of contextual information, examples and details that others will easily find engrossing and of significant relevance.